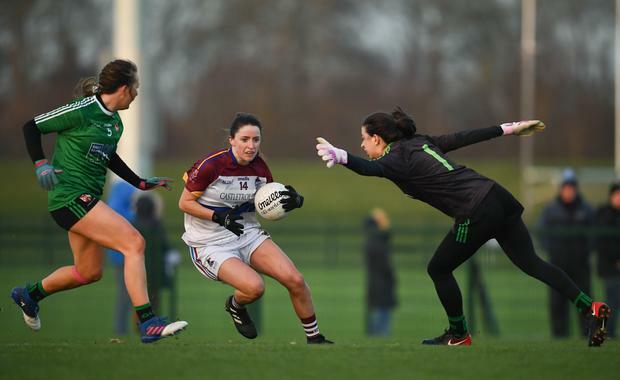 Tipperary star Rosin Howard hit a hat-trick and Kerry’s Hannah O’Donoghue added two more goals to help University of Limerick into their sixth straight Gourmet Food Parlour O’Connor Cup final and past a determined challenge of Queens University in Abbotstown. Captain Eimear Scally was also to the fore for the 2018 runners-up with 1-9 as her side pulled clear in a dominant second-half to set up a repeat of the 2016 final with UCD, which takes place tomorrow (SAT) at Grangegorman at 4pm. The game was only three minutes old when Galway senior Louise Ward burst through the Queens defence and hit the roof of the net for the game’s first score. Queens had the advantage of the wind in that first-half and soon settled when Niamh Reel kicked a free and Eimear McAnespie fisted a point soon after. But UL were sharp and in Cork attacker Scally they had the game’s most dangerous player. She pointed a free after 13 minutes when Hannah O’Donoghue was fouled, kicked a great score from play a minute later and then scored her third point in as many minutes to put her side 1-3 to 0-2 ahead. Sarah Britton was on song at the other end too though and her direct running brought a score for Queens, but UL hit back with two in a row, with Cork duo Shauna Kelly and Scally on target. Queens were five points behind at that point but they were thrown a lifeline in the 21stminute when Laoise Duffy intercepted Caoimhe Moore’s kick-out, passed to Grainne McLaughlin and the Antrim player hit the net with a great finish. A Reel point cut UL’s lead to the bare minimum straight away, but from there to the interval UL bossed affairs. Shauna Howley and Howard hit points for UL to give them a six-point cushion, but Howard finished off a flowing move to the net in the 30th minute and then added her second goal two-and-a-half minutes later to put UL 3-8 to 1-5 ahead at the interval. Queens looked to cut that lead straight after the restart but Slaine McCarroll’s effort hit the crossbar and then the post before it bounced safe. Instead, Rebecca Delee, the 2018 TG4 All-Ireland Junior Final Player of the Match, pushed UL further ahead with a fisted score, before O’Donoghue struck UL’s fourth goal, which sunk Queens’s hopes in the 32nd minute. They did respond when Reel struck a brilliant goal two minutes later, but there was no stopping UL. Scally kicked back-to-back frees and then she got on the end of a loose Queens kick-out and finished to the net for a 5-12 to 2-6 lead. O’Donoghue scored her second goal seven minutes from the end and Howard completed her hat-trick two minutes later as UL pulled clear in a dominant final quarter. Scorers – UL: E Scally 1-9 (6f), R Howard 3-1, H O’Donoghue 2-0, L Ward 1-0, S Kelly 0-1, S Howley 0-1, L Ryan 0-1, R Delee 0-1, F McHale 0-1, O O’Dwyer 0-1. Queens: N Reel 1-3 (1f), G McLaughlin 1-0, S Britton 0-2, E McAnespie 0-2, L Duffy 0-1, S McCarroll 0-1. Subs: E Fitzpatrick (Tipperary) for Needham (40), F Tagney (Kerry) for Howley (40), O O’Dwyer (Tipperary) for Cregg (46), S Murphy (Kerry) for Scally (50), A Healy (Laois) for McGrath (50). Queens: J Curran (Antrim); K White (Down), C McCambridge (Armagh), A McConnell (Tyrone); O Lavery (Down), S McCarroll (Tyrone), C McGill (Armagh); N Coleman (Armagh), A McHugh (Tyrone); L Duffy (Down), N Reel (Armagh), E McAnespie (Monaghan); O Duffy (Down), G McLaughlin (Antrim), S Britton (Fermanagh). Subs: A McDonald (Tyrone) for McGill (h-t), C Stewart (Antrim) for McConnell (42), N McIntosh (Antrim) for Lavery (42), M McCreanor (Down) for McLaughlin (42), M Kavanagh (Down) for Britton (53), V Boyd (Down) for Duffy (59).